I finally sat down to figure out how to make a red mole sauce on my own and it turned out so so so good. This recipe is great for about a million reasons, but I’ll just share a few. It’s a crockpot recipe, making it very hands off. You just blend most of the ingredients together, dump it over chicken in the crockpot and let it cook. Easy peasy! Traditional mole sauces can take days to prepare, but the crockpot actually helps speed up the process. (That’s probably the first time a crockpot meal has been described as speedy!) This red mole sauce is quite rich and full of flavor, but not too spicy, so kids can enjoy it, too. However, you can definitely add cayenne pepper for more heat. Heat is good. And the richness from the unsweetened chocolate counterbalances the heat of the peppers beautifully. 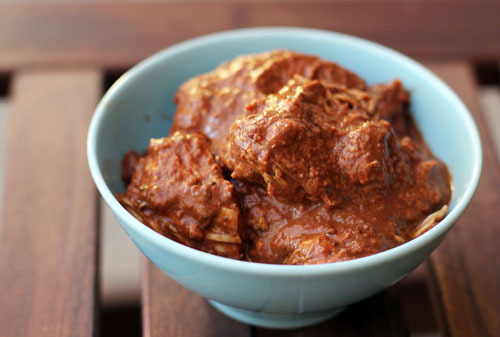 Lastly, this recipe for chicken mole rojo is healthy! I originally developed it for Disney and had to follow strict dietary guidelines, all of which I met in this recipe. And, if you have kids, just tell them they are eating mud and they will eat every bite of their dinner. It’s like magic. 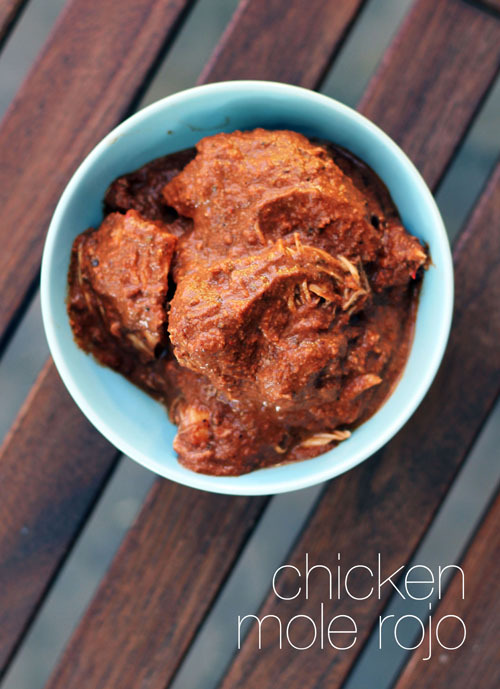 Place chicken in a crock pot. Add all ingredients EXCEPT chicken, baking chocolate and cocoa powder to a blender. Blend well. Pour sauce over the chicken in the crock pot. When chicken is cooked through, heat the baking chocolate in the microwave for 1 minute. Remove and stir until all the chocolate has melted. Sift cocoa powder over the chicken and also add the melted chocolate to the chicken. Stir well, breaking up the chicken into large chunks as you stir. Add cayenne pepper to taste at this point if you want to add some heat. Serve with tortillas, rice and beans. GREAT recipe, Jane! Thanks! Next time you’re in SLC, you must visit Red Iguana. Great variety of delicious moles. yes I must – I have never eaten there but have certainly heard about it!! I order mole enchiladas almost every time I see them on a menu. I just had mole last night at a place on Main Street in Los Altos, CA called Casa Lupe. Yum! I’ve had some outstanding ones and some only ok ones. I’ll definitely make this recipe. Also, want to know one thing I’ve found that goes really well with mole? Cole slaw! Something about the hot and cold, crunchy and soft, sweet and vinegar, is so good. you’ll have to try the green mole at lulu’s – and savor it for me! and next time we’re in the bay area might have to try case lupe! I bet the coleslaw is so yummy – GREAT idea! thanks for sharing, love it! I looooove mole. Excited to try this recipe! Thanks!! I made this mole for dinner tonight and it was delicious. I followed the recipe and it turned out great. Such an easy recipe. Next time I am going to try chicken thighs with bone in. One question, my mom is allergic to almonds. Is there something I can substitute for the almond butter or can I leave it out?